This thread is now open for discussion about the Evening Reception. 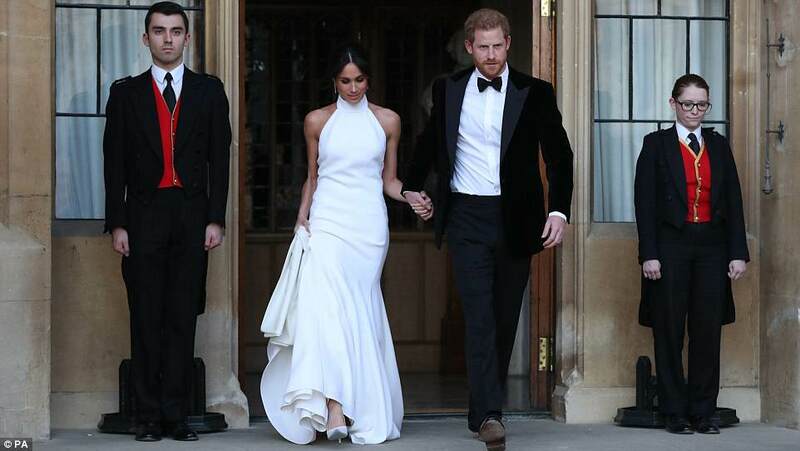 The Duchess of Sussex will wear a Stella McCartney "bespoke lily white high neck gown made of silk crepe" for the evening reception. 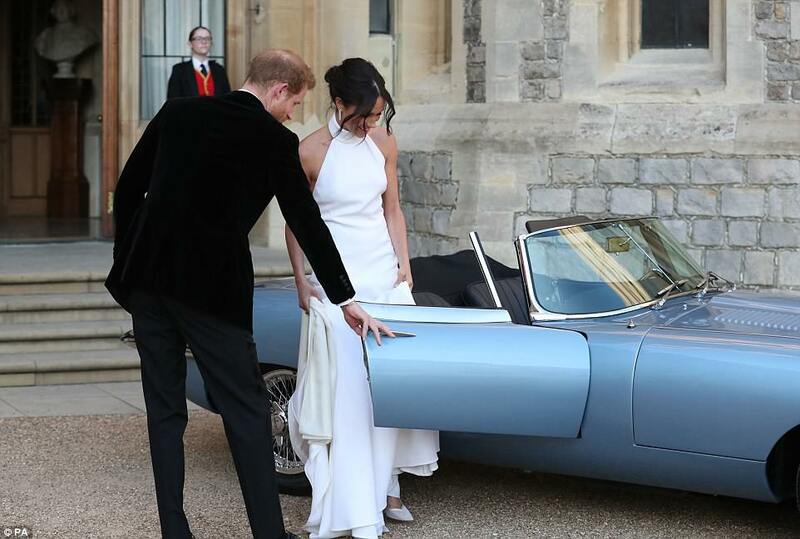 Harry and Meghan have come out of Windsor in an E-Type Jag. Nice second look from Meghan. Neckline is different. Obviously a different dress for the reception. This one has a halter neckline. I love the Aston Martin car, very James Bondian - edited to correct: apparently it's an electric Jag. Very cool. Obviously a different dress for the reception. This one has a halter neckline. I love the Aston Martin car, very James Bondian. As stated in earlier posts, this dress is designed by Stella McCartney and is a bespoke lily white high neck gown made of silk crepe. The car is an E Type Jag Electric. 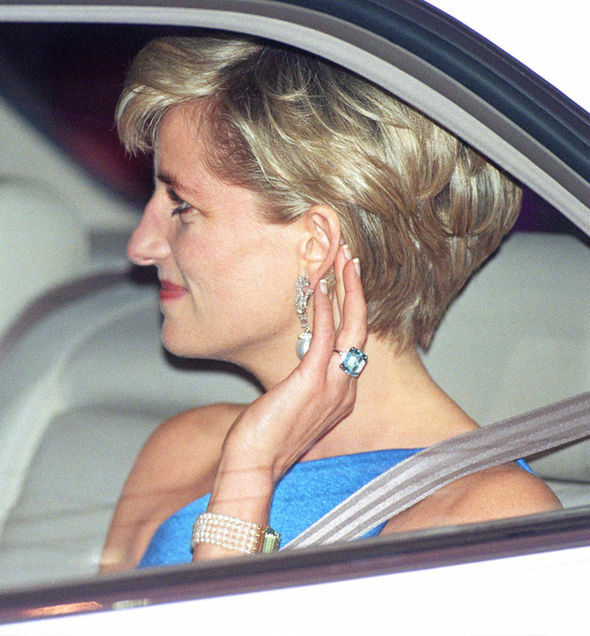 Ok just saw confirmation...appears it was Diana's! Wonderful that people (Mr. Nacho) are showing of their invitations on instagram. Let's trust it doesn't end up like the Greek birthday bashes of last year. I am sure the palace will have a no social-media policy for the guests in place during the evening at least. A wonderful ring btw. I believe it comes from a set with a bracelet and earrings? I think her loose hair behind her ears for the ceremony was to let it go to the face when she dresses up for the evening reception. That way she didn't need another hairstyle. At least, its what I believe it happened that way (on purpose). I love that ring...I wanted it for her engagement ring! So glad to see her wearing it! Almost like an Oscars Dress code. Will we get pictures from the other royal guests e.g. The Duchess of Cambridge? 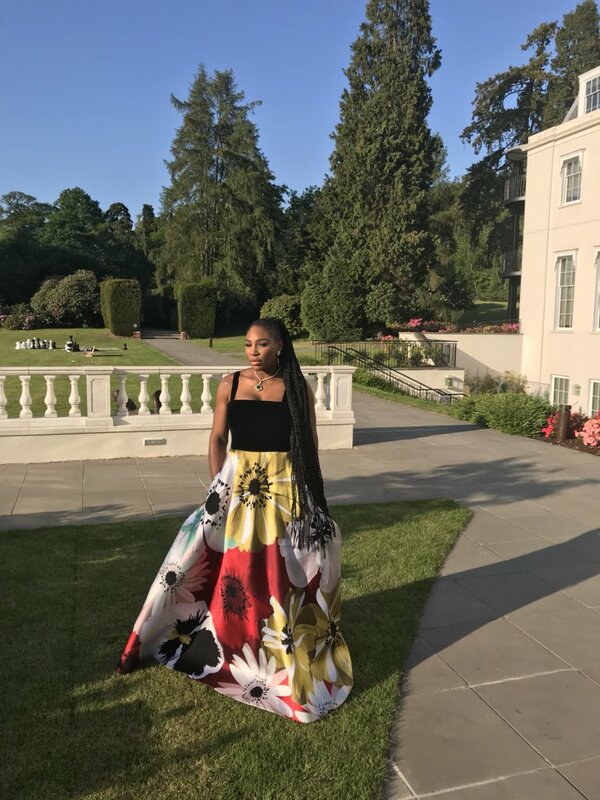 Boy, that's an ugly dress from Serena Williams. WOWZA! Another home run for Meghan! Harry look so debonair. They are such a glamorous but elegant couple! How far is Frogmore House from Windsor Castle? Half a mile, not even 5 minutes. Its a black tie evening party. Sure she will fit in well with many of the women at the event.